Saturday was a closed session on the track for the RCN Circuit Challenge and not wanting to miss the action we headed back to the viewing area at Brunnchen which unlike on Friday was much busier for this touring car series. We set up for some track side action with loads of locals, some of which had arrived for the day looking at the BBQ's and beer!! We were not disappointed as a whole mix of cars drove by, from your basic Ring fare of BMW 3 series and 911's both new and old, too VW Golf's both MK1, 2's and 3's, VW Polo's, Vauxhall Nova's, Citroen AX's, Porsche 924/944/928's, Honda Civic, MGB GT's and even a Renault Alpine. Viewing these cars passing by couldn’t be better with sections cut into the fencing for getting the best picture opportunities. Around the track are footways leading all over, heading round from Brunnchen, about a 15minute walk takes you to the inside of the Karussel where you can really appreciate the camber on the lower section and an awesome viewing point to see the cars powering through. The short walk also lets you see a little of the scenery that the track rises and fall through. The change in level you just don’t feel when you’re driving around but the track rises 300m in some section, the picture below demonstrates the run up to the Karussel. After watching the awesome procession till early afternoon we headed over to the awesome Nurburgring/Arean centre behind the main stand of the Formula 1 track. On the weekend we had arrived there was some track action from what you could see from the main gantry that lead in to the centre, it looked like Le Man style cars with the sound echoing round the complex. One of the first things you notice besides the huge orange "Nurburgring" sign is the roller coaster ride which when you follow it round goes through the centre its self!!!! And what a centre, you walk into a huge open area with shops along the track side by the likes of Aston Martin and Nisssan as well as themed cafe's. On the other side it the Ring Arena, a massive entertainment area. On the day we were there, there were market stalls set up along the left side selling all kinds of car related merchandise from model cars to metal signs etc. I did get carried away adding to my collection of Minichamp Lamborghini's!!!!! Out the other end your met with the Paddock Shop selling everything Nurburgring related, t-shirts, nch needed stickers, jackets, models and maybe not, like the toaster that puts a map of the track on to your breakfast!!!! The one thing we didn’t have time to do on our "tourist" day was go round the museum, for two reasons, first it was far too late in the day when we got to it, and secondly it’s sold with a pass through the interactive kids area which pushes up the price to just shy of 19Euros!!!!! With the day coming to an end we headed back to the track, first to another viewing area at Pflanzgarten and then back again to Brunchenn to see what else was on the track, but also to see the respect and good nature that is given by the drivers to the marshals who had been around the track all day keepign them safe, by doing a slow lap and giving a wave to them all. As well as the last remaining spectators like us who were waving back and clapping them on for a great days entertainment. 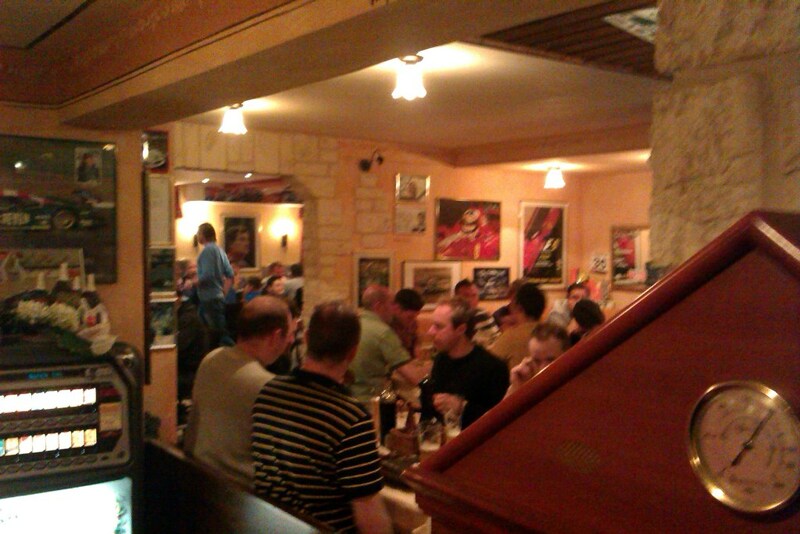 After a brief pit stop at the hotel we headed over to Pistonklause in Nurburg for the evening. The only way to describe it would be similar to what I see the Cresta Run as i.e. a little bit of Britain in another country. The main claim to fame about this place, apart from the fantastic food it the fact its owned by the parents of Sabine Schmitz, Oh you know Top Gear, Transit, 10min lap, there you go. Word of mouth must also have something to do with it being a petrolhead Nirvana. 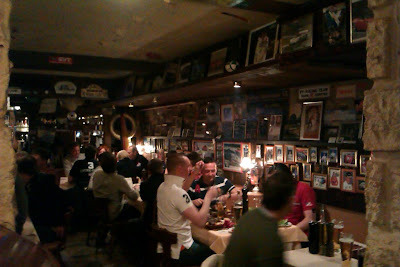 At some point it was obviously a quaint restaurant but today every wall is covered in racing memorabilia, photos and bits of cars. What’s not covered in "official" memorabilia is covered in names and club stickers from all those who have been there. This is a must if you ever visit the Ring, but book early. Next time, a taxi, the paddock, the second lap and the drivehome. Hi bro, that huge orange nurburgring sign located inside or outside ring? If outside that sign can be found from the main road right? Its on the main road that goes past the ring, on the side of the Arena. You see loads of cars parking up for a picture.